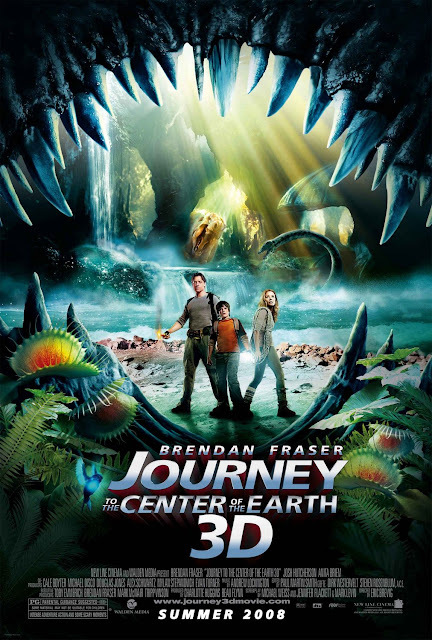 Movie: "Journey to the Center of the Earth"
A scientist named Trevor Anderson (Brendan Fraser) attempts to follow up on his deceased brother's research. While watching his nephew Sean (Josh Hutcherson), they discover new information that leads them to Iceland. With the help of a local mountain guide named Hannah (Anita Briem), they discover a passage that leads them to a perilous hidden world at the center of the Earth. "Journey to the Center of the Earth" is a modern day re-imagening of the classic Jules Verne story. This film is directed by Eric Brevig and is not an adaptation of the novel in any way. In fact, the book itself plays an integral part of the plot of the movie. So, in a movie called "Journey to the Center of the Earth," the characters read the book "Journey to the Center of the Earth," which leads them on a journey to the center of the earth. This movie was meta before meta was a thing. Beyond this already ridiculous premise, the entire thing is silly at its best. It stars Brendan Fraser, a known goofy actor in his own right, as Trevor Anderson. Trevor has been very troubled by the loss of his brother nearly 10 years earlier, and is a little obsessed with continuing his research no matter the cost, be it monetary or personal. Josh Hutcherson plays Sean, Trevor's nephew and the son of his deceased brother, who is being forced by his mother to spend a week with his uncle while she prepares them for a move to Canada. With a chip on his shoulder, angry for no reason, like all warm-blooded American teenagers, Sean cannot wait to be left alone, but in an odd twist of fate, this uncle and nephew have much more in common than they think. They soon find themselves boarding a plane to Iceland where they meet a guide named Hannah, played by Anita Briem, who will take them on their mission to find whatever it was Sean's dad was looking for before he died. This can be reduced to the following simple plot line: our protagonists find this location, go to that location, then try to escape the location alive. Things happen to them during their adventure as they encounter many new creatures and obstacles, most of which want to kill them. Even watching this at home 8 years after being released in the theater, we could tell "Journey to the Center of the Earth" was made specifically with 3D rendering in mind. The action rarely if ever stops, and throughout the very long 1 hour and 33 minutes this movie lasts, objects of all shapes and sizes are constantly hurled at the camera in an effort to make audience members have some sort of seizure. Remember, in 2008, these visuals were cutting edge and implemented in nearly every movie that could afford it. These poorly CGIed objects fly towards the audience as a gimmick, and even though those responsible behind the scenes clearly loved using these effects, they are so awful looking. It's utterly surprising to us the CGI is as bad as it is considering director Eric Brevig spent most his career doing visual effects. Not all of the blame falls on the graphics, no no, there is much more to this colossal misfire of a film. The acting isn't much better. Brendan Fraser has never been one of our favorite actors, and in something like this, it's not hard to see why we feel this way. Dude is corny as hell, especially in these big, grandiose action movies. Josh Huchterson is pretty much the only good thing about this movie, and even as a young kid, we can see he's always had potential. The dialogue is also pretty awful. Jokes and puns come frequently, none of which are remotely funny. Finally, for good measure, a tacked-on love story is thrown in the mix, as if there wasn't enough going on already. Aside from the occasional exciting moment, "Journey to the Center of the Earth" is just too ridiculous and too poorly written for anyone to honestly enjoy. Rotten Tomatoes is kidding itself if they think we're buying this film has a 61% on their site. One year ago, we were watching: "Sidewalls"